Montestigliano is a compound of historic villas and farm houses. I felt at home in Villa Pipistrelli. That feeling of comfort was not an accident. “It’s simple. 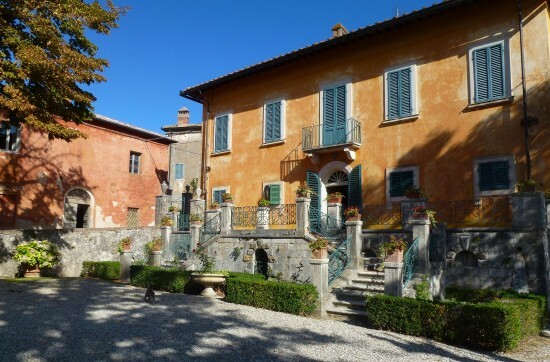 We want our guests to feel like part of the family,” says Luisa Donati, marketing manager for the family’s Pipistrelli, Montestigliano, and Palazzo Donati Mercatello (in Le Marche) properties. To feel like part of this family would be an honor. Signore Giancarlo Donati, the patriarch who’s in his 80s, is a talented business man with a big personality. Sixty some years ago, he learned to fly and bought a small plane. On one of his first flights he shocked the citizens of Mercatello by bombing the town with ripe peaches. Virginia, the eldest child, is an architect, fearless singer, and animated dancer. 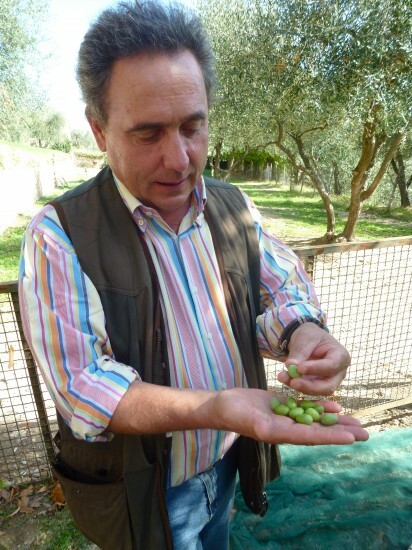 Massimo Donati discusses the olives that are raised to produce the family’s signature extra vergine olio d’oliva. Massimo is the farmer who manages the olive oil production, as well as the family’s efforts in sustainable energy from BioGas methane transfer. He’s also the leader in solar energy capture on the properties. Damiano is the family accountant, a spirited singer, and master griller. Marta provides administrative support for the business. Once a week, guests from the Pipistrelli and Montestigliano properties are invited to a dinner hosted by the Donati family in the spacious top floor of the old granary. The food is prepared by Anna, the talented young Polish chef, who has been with the family for nearly ten years. All the food is procured from local suppliers. The olives for the extra virgin oil are grown on the property. Luisa introduced me to a cheese maker named Fiametta whose four different pecorino cheeses were featured. Luisa told Fiametta that she would have the opportunity to address the 60 guests and speak briefly about her cheese, and that Luisa would translate. Fiametta looked very nervous about the prospect but we both encouraged her to try. By the end of the evening, after Fiametta had taken several orders for cheese purchases, she said to Luisa, “That was great fun, I want to do it again sometime soon!” Ah, a celebrity is born. Luisa and Massimo make everyone feel like family around their dining table. 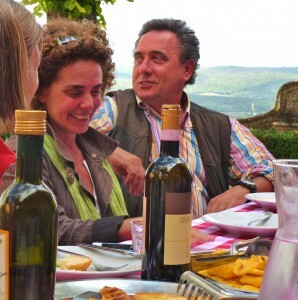 I mixed with some of the guests who were staying at the Montestigliano property. Many of them told me that they had been visiting for decades with friends and relatives (some multi-generational) in tow. The meal was excellent. All five Donati siblings mingled with the guests. After dessert Damiano grabbed the karaoke microphone and kicked off an hour of singing and dancing.